When is a Trans Am Turbo not a Trans Am Turbo? When someone removes the turbocharged engine and slots a 350ci Chevrolet V8 in its place. 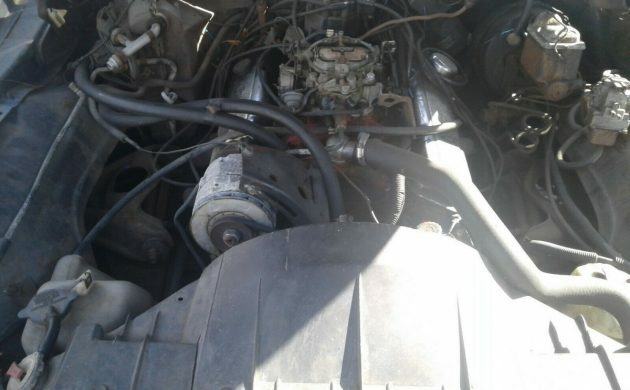 That’s what the owner of this 1980 Trans Am has done, and I know that there will be people out there who will breathe a sigh of relief. However, the option is available to reinstate the car’s turbo credentials, and that will ultimately come down to individual tastes and preferences. 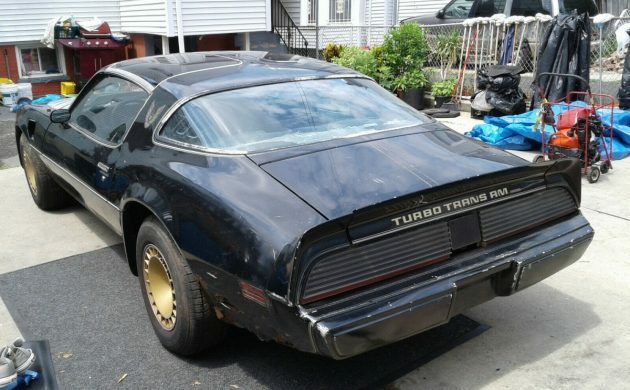 Located in Newark, New Jersey, you will find the Trans Am listed for sale here on eBay. 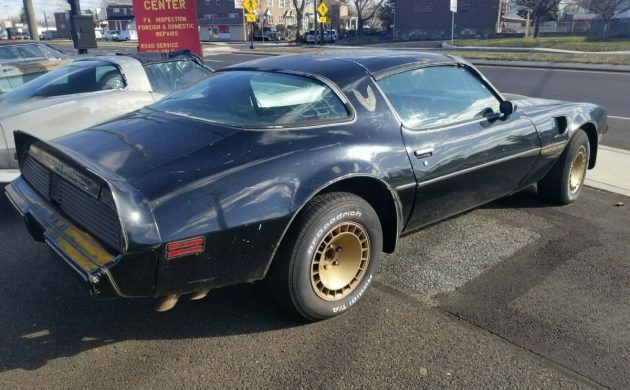 There is no hiding the fact that the new owner will have some rust to address in this car, which is not that uncommon in a Trans Am of this era. There’s rust visible in the fender on the driver’s side, in the top near the T-Top, in both quarter panels, and around the trunk lid opening. There is also a significant amount of rust in the floors, but none of this is beyond repair. 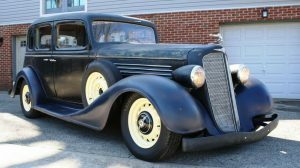 Thankfully, the car looks complete, but I guess that how this restoration is tackled will depend on either financial viability, or whether the new owner is fixated on owning a Turbo. The concept of a turbocharged V8 engine at Pontiac started as a student project that was undertaken by automotive engineering students at the General Motors Institute in Flint. The original target engine was Pontiac’s 350ci engine, but by the time the concept was completed, the 350 was out of production. 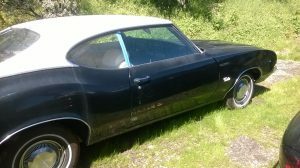 Pontiac engineers then adapted the concept for use on the 301ci engine and ended up with an engine that was running 9psi of boost on a modified and strengthened 301. The concept was fine, but motoring journalists of the era noted issues with pre-ignition, and also found difficulty in achieving consistent performance figures from the car. In spite of having a 20hp advantage over the manual Camaro Z/28, the automatic only Trans Am consistently posted slower acceleration times than the Z/28. 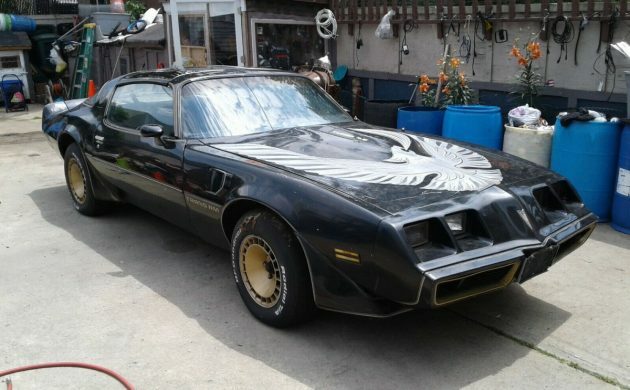 The owner of this Trans Am has ditched the 301 in favor of a Chevrolet 350ci V8. The car is also fitted with power steering, power 4-wheel disc brakes, and factory air conditioning. The owner says that the car runs and drives. He also says that if the new owner wants to return the car to its original specifications, he does have a date-correct 301 Turbo engine and matching transmission, although he doesn’t indicate whether this will be included in the sale, or if it’s available at extra cost. 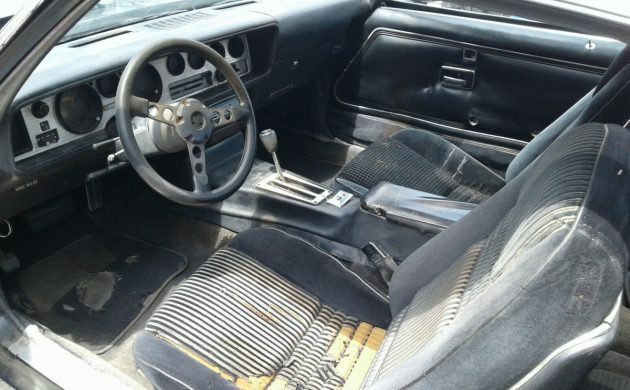 The interior of the Trans Am looks quite tired, and it is going to need a fair bit of work, from addressing the crack in the dash pad, the shredded covers on the seats, through to missing items like the armrests that are missing off the doors. There are some nice optional and comfort items fitted to the car, including a tilt wheel, cruise control, power windows, power locks, and a power trunk release. In its day, the Trans Am Turbo was a much-maligned vehicle, and even today, there are people who simply won’t accept them. However, nice examples seem to perform well in the market. Between the standard Trans Am and the Indy Pace Car versions, sales of the Turbo models in 1980 accounted for nearly one-third of all Trans Am sales. 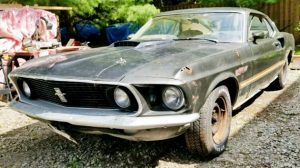 Today, a good example will set you back somewhere in the region of $30,000 or more, but there are cheap project-grade cars out there. At the time of writing, bidding is sitting at $3,500, and the reserve has been met. So, would you consider owning a Trans Am Turbo, or are they are a car that you’re no fan of? I know what you mean. The Honeycomb wheels were designed to be decorative and very attractive. The Turbo wheels were designed to be more functional, as they helped to extract hot air from around the brakes. I like the Honeycomb ones more, but I understand why the Turbo ones were made that way. I think I’d go with the honeycomb’s also, but the turbo wheels have a subtle look that is appealing, especially on a white car. Functional is a plus also. Not sure. No offense, but I’m not sure if anything about that story was true. First, the turbo trans am didn’t show up until 1980. Secondly, I’ve owned multiple turbo cars. These turbo chargers had no problems what so ever. With normal maintenance, they would routinely go 80,000 miles. Also, nothing goes wrong with a turbo charger except the bearings wearing out. You can’t do that with anything other than mileage or no oil. I think there may be a little exaggeration or creative memory going on here. Good story though. Turbocharge the 350, problem solved. If you could buy it for $5G or less you could make a decent car out of it. I recall reading that the Turbo Trans Am featured in one of the Bandit sequels had a 350 transplanted into it just to get through filming. Buy the car, clean it up, then drop whatever motor and trans your heart desires. Don’t know where you heard that, but it’s total b.s.. All the cars in S. And the B. 2, were bone stock. One had exhaust removed to make it louder, but they were otherwise untouched. 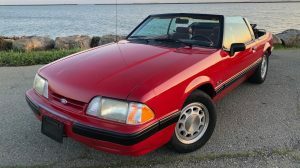 It would be fun to swap a Grand National engine in this, just to keep it “turbo” — since the base Firebirds at this time already used the Buick 3.8 V6, it probably wouldn’t be THAT difficult to accomplish. Be more fun to swap in a 650-hp LT4 crate engine. I love the 78 and older T/As but really dislike this style because of that front end. I think the concept of a turbo V8 was pretty bold for that time and probably would be worth saving if a better controller and maybe even fuel injection was added (Holley Pro-Jection?). The factory device that controlled the turbo was too limited by the technology at the time. It had a really basic sensor that listened for knock and constantly retarded the ignition. Car magazines couldn’t get a consist acceleration run because it would run good one time and poor the next time as the controller would dial the advance back as the engine got hotter. Had 1980 TURBO, WHAT A DOG. mY 50 bUICK COULD BEAT IT FROM A DEAD START. sHOUH HAVE4 HAD A SUPER CHARGER. IN IT. Side scoop = Turbo. I had an 81. Sad story.